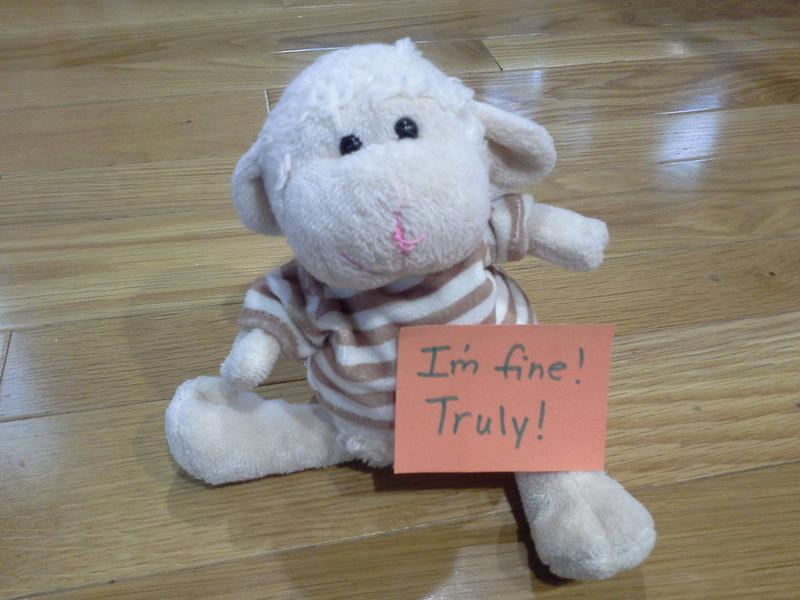 Wooliam is a stuffed lamb whom Ace and his classmates take turns hosting. This endearing little creature participates in the family’s activities and chronicles them in a journal entry. Naturally, the chosen four-year-old is thrilled over the opportunity to oversee him. I must admit, though, that “thrilled” is not an apt description of my own reaction. While I applaud the spirit of this tradition and appreciate Wooliam’s importance to Ace, hosting duties can be . . . well, a wee bit burdensome. Not because Wooliam is a troublemaker (he’s not, although he has managed to get lost and throw us into a panic every single time he visits our house, starting with his first visit to Sonny over two years ago), but because of the journal. The journal is not only read to the preschool class but accompanies Wooliam on each visit for the host families to enjoy. Not to overthink things, but the temptation to manipulate an activity or two in order to make our family seem well-adjusted and not too tedious (or neglectful of Wooliam) is real. Turn off the TV and let’s play Battleship, everyone, and then let’s go to the park! Which brings us to this last visit, which happened to land over spring break. Yes. When it dawned on me that Ace would be in charge of Wooliam for eleven whole days, I had two simultaneous thoughts: a) Where can I buy Wooliam’s twin in case we lose him for good this time, and b) How can we possibly come up with eleven days’ worth of journal-worthy activities? But fast-forward to spring break’s end, and Wooliam’s selective reporting had come through for us yet again. Bless him. Good old Wooliam. Ever the gracious guest, he manages to make us look competent. He is grateful and uncomplaining. He looks and listens for the wholesome beauty and turns a blind eye to the rest. I could take a lesson and look and listen for the beauty, too, and spend less time dwelling on the messy—not in order to appear more competent, but in order to be more grateful. Not to deny or veneer the messy realities that need acknowledgement or resolution, but to welcome the everyday gifts concealed in messy wrapping. Last fall, for example, I was felled by a nefarious strain of the stomach flu and spent a miserable day flat on my back. But Sonny wrote me a note: “I love you, Mommy!” I awoke at one point to Ace’s favorite dinosaur book propped on my nightstand; he’d brought me the best thing he could think of to make me feel better. Both boys crept in periodically to rub my arm and ask in whispers if I felt better yet or if I needed more water. They proudly announced that they’d cleaned the house without even being asked. The discomfort of this nasty virus? Messy. My sons’ blossoming compassion and empathy? Beautiful. My kitchen is in an almost permanent state of disorder: smears of sunbutter and crumbs of play-dough, sticky spots, ubiquitous papers and crayons. I can’t take two steps without stepping on someone who just wants to help. But it’s the space where my family gathers to play and create and cook. It’s where Sonny and Ace learn to pitch in. It’s our favorite landing spot when we want to connect. My kitchen is messy. My kitchen is beautiful. Is the minivan a messy place? Yes. Is it a beautiful place? Yes. Beauty does not eradicate messiness. The stomach flu is still miserable and always will be; my kitchen is still in disarray; I sometimes consider changing my official primary address to “minivan—the messy one.” And some heartaches and struggles are too large to be glossed over by a surface check for the positive. But at other times, if we look and listen for the beauty, we will see it. Thanks, Wooliam, for the reminder of what to look for. You’re always welcome at our house, and next time I promise to hide the pipe cleaners. This essay is part of the Messy, Beautiful Warrior Project. To learn more and join us, click here. To learn about the New York Times bestselling memoir Carry On Warrior: The Power of Embracing Your Messy, Beautiful Life, just released in paperback, click here. My dad has two sayings related to possessions. The second saying: “Whatever you own owns you.” Dad would offer up this one up whenever we suggested getting a horse, for example, or buying our own camper instead of renting one. Or installing a pool. It seemed that horses, campers, and pools all demand a lot of work and time. If we acquired these things, they would own us. We’d labor on their behalf; we would be their slave. Their slave! This second piece of wisdom works better for me. Its truth looms large whenever we’re faced with a home repair or car problem. And recently I spent several hours in the basement, rearranging the storage area and trying to determine which items were worth saving after a water leak had dampened them. “Whatever you own owns you,” a voice in my head mentioned. Yes, it was true. I was sweating over stuff we seldom or never used. This stuff owned me—or at least it had retained me for the afternoon. In that moment, new motivation dawned for spring cleaning. Humming “You Don’t Own Me,” I surveyed the house and pondered which possessions were worth even moments of my service to them. This tower of rags? A few, yes; the rest, no. The paint left behind by the previous homeowners? No. The pipe-cleaner and bead necklace that Ace made for me? Yes. The springform pan? Yes. Cheesecake, you know. This shrieky little toy from a long-ago kids’ meal? Obviously a rhetorical question. The note that Sonny wrote me in church last week? Yes. The malfunctioning camera that could possibly be repaired? No. The Hunger Walk shirt that I haven’t worn in years, even for yard work? No. Decisions about small things were easy. Those about large things were more challenging. The TV? The extra electronic devices? Stored furniture, even though we like it? Well . . . no. Meanwhile, what else could I emancipate myself from? The embryonic grudge from yesterday’s misunderstanding. Concern about what others think of me. The avoidance of conflict, even potentially helpful conflict. Unrealistic expectations of myself and others. I don’t want these things to own me, either, even briefly. They are not worth my time and effort. Nor do I want them to shape who I am and infect my relationships. So although tossing them out won’t be as easy as dropping that shrieky little toy into the trash can, it’s an effort worth owning—and owning me.